This week MSI has announced the availability of a new motherboard built for Threadripper: the X399 SLI Plus. MSI says the SLI Plus is an optimized workstation motherboard built for designers. Like the X399 Gaming Pro Carbon, it uses heavy plated heatsinks and 'Military Class VI' components. Although MSI is aiming at the professional market, they have still added plenty of features for gamers and enthusiasts as well, given the overlap in requirements. 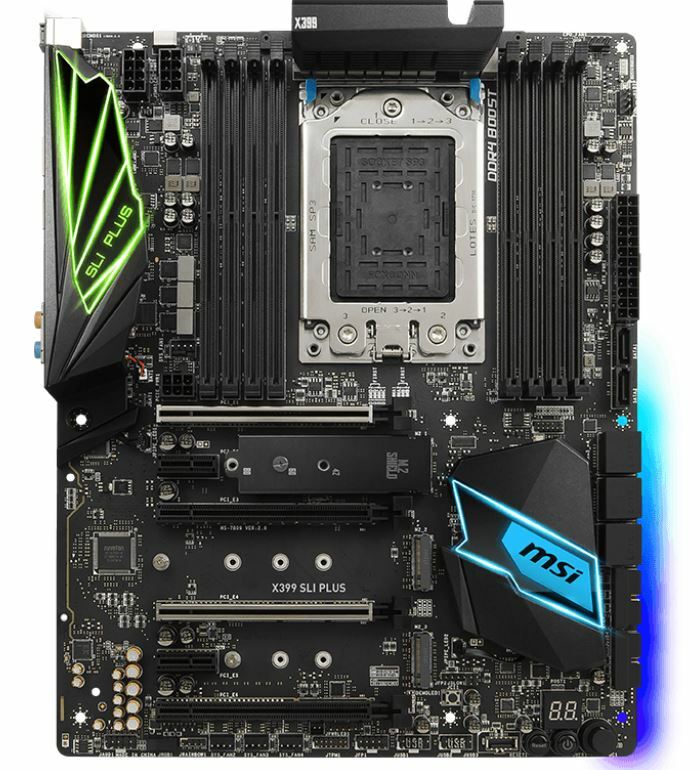 As with other X399 boards, the MSI X399 SLI Plus uses eight total memory slots, although these are not reinforced. This configuration allows for up to 128GB of RAM in a quad channel setup. MSI uses their DDR4 Boost technology on the SLI Plus and lists memory speed support up to DDR4-3600+. Power delivery is handled by a fully digital 13 phase VRM which looks quite similar to the Gaming Pro Carbon AC. Per the Military Class VI specs, it uses Titanium chokes and 'dark' capacitors. We cannot confirm by the pictures, however, it is likely using the same DrMOS ICs found on the Pro Carbon. Power is fed to the VRMs by two 12V CPU leads (one is optional) located in the upper left-hand corner of the board. The SLI Plus has a full two character debug LED as well as a simplified four LED debug system with LED’s for Boot, VGA, DRAM, and CPU. The SLI Plus has a total of six PCIe slots: two PCIe 2.0 x1 slots and four full-length PCIe 3.0 slots. The two main GPU slots, capable of running x16/x16 if they are the only ones populated, are reinforced with MSI’s Steel Armor to support heavy video cards and prevent potential damage to the slot. The motherboard supports 4-Way NVIDIA SLI and 4-Way AMD Crossfire technologies. For storage, the SLI Plus has a total of eight SATA ports fed from the chipset, and has the same physical location and orientation of the Pro Carbon; six horizontal and two vertical. There are a total of three PCIe 3.0 x4 M.2 slots which get their lanes from the CPU. Two of the M.2 slots support up to 80mm drives, while the middle slot can handle up to 110mm modules. Only the top M.2 slot has a heatsink for cooling down the installed M.2 module. U.2 support does not make it to the SLI Plus. The audio side of the house is managed by a Realtek ACL1220 codec working in conjunction with MSI’s Audio Boost 4 suite. While the Nahimic software package normally found on the gaming products does not make its way here, the SLI Plus uses separate audio layers for left and right channels, de-pop protection, Chemi-Con audio capacitors, EMI shielding and board separation, and a dedicated headphone amplifier which auto-detects impedance (use up to 600Ω). 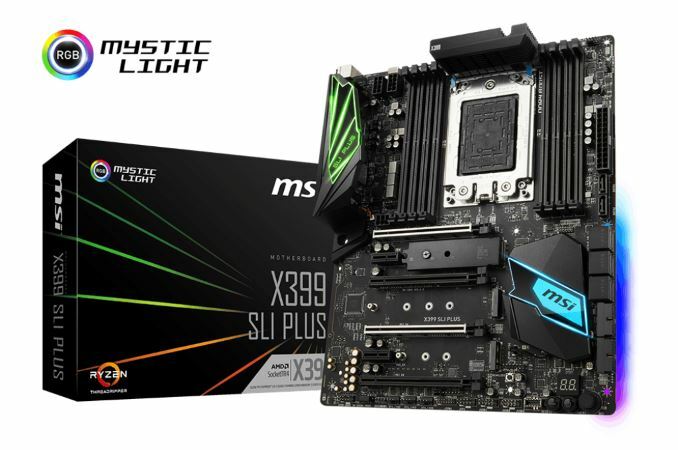 As far as the overall aesthetic, MSI uses a black PCB and color scheme and lets the integrated RGB LEDs fit whatever theme a builder has in mind. LEDs make it on the back panel IO shroud, chipset heatsink, and a strip found on the back of the board under the SATA ports. Additional RGB LED strips can be added via the two onboard RGB headers. One is for a rainbow strip, while the other for general RGB; both are controlled by MSI’s Mystic Light software. Pricing was not listed, but we do expect the SLI Plus to come in under the Gaming Pro Carbon. Previous HEDT SLI Plus motherboards have often been the cheapest available, and it would be abnormal if this board was different. We should see these available for purchase soon. I must admit ,I agree, the title should not contain the word budget as a statement if the article only references it by assumption. Then it feels like click bait a little bit. I can follow the logic , but it is not a fact at this point. It'd be nice, but according to other sites MSI hasn't given pricing info. On the other hand, while less loaded down than other X399 boards it still has enough stuff on it that it's still going to be pricey. On other sites it is referred to as a "content creation" product, again with zero indication what qualifies it as such. Same thing here, but its "budget".